Slow Roasted US Beef Short Plate in Kare Kare Sauce with Turmeric Rice, Creamed Banana Heart, Grilled Eggplant Chutney and Garlic Petchay Saute. I met Lara Day, a Filipina by birth (mom’s side), when she was a freelance writer based in Hong Kong. At that time, she also wrote food and travel articles about the Philippines for Time Magazine Asia. Now, she has moved to Thailand to be the Features Editor of Travel + Leisure South East Asia. She’s doing a story on Modern Filipino Cuisine, so it was no surprise that Chef Laudico would be featured — nobody does that better than him. It is always a pleasure to meet up with her when she is in Manila because we get to talk about what people think of the Philippines as it continues to evolve over time. I would like to share with you our dinner experience with Lara and the best chef couple — Chef Roland and Jackie Laudico, who are continually taking Filipino food to the next level! The Best Seat in Bistro Filipino! Chef Jackie shared this tip: The best seats in the house are actually in the middle where you can see the giant mirror directly opposite you. From this viewpoint, you can almost see everything inside the restaurant and you can see the chandelier directly above you. For groups, some prefer to be in the middle of the restaurant, just bordered by a see-through weaved divider for privacy. The restaurant has well-designed acoustics — you won’t hear the people talking at the next table. Trio of Appetizers (P288 +10%sc). Sisig Basket, Ubod Spring Roll, and Stuffed Fishball. 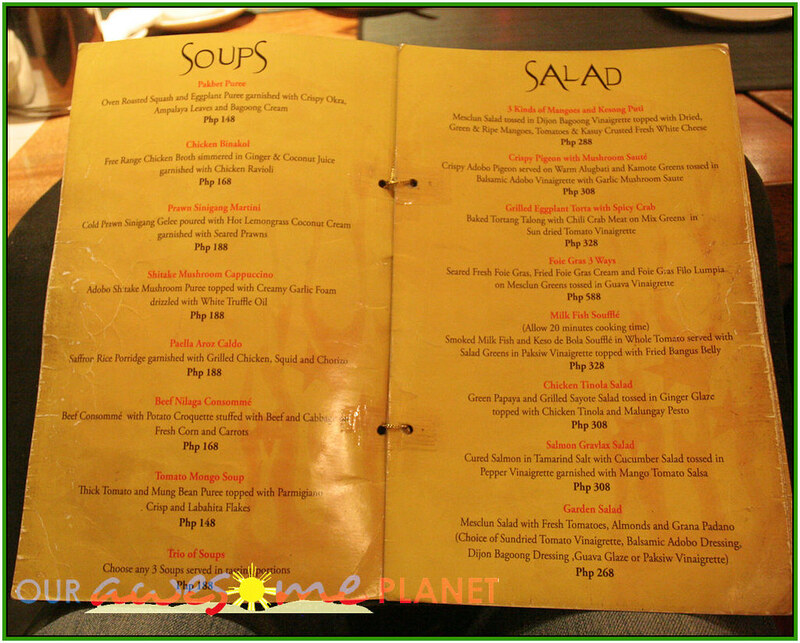 Filipino street food is glorified in this signature serving where the appetizers revolve around like planets with the sauce as the center. I always love eating the Ubod Spring roll, especially when the iced vinegar is drizzled on top first before chomping on it. During the ala carte buffet, we often ordered a lot of this spring roll. The stuffed fishball is a bit heavy, though. It is dense and does not taste anything like the fishball we can buy on the streets of Manila. The bite-sized sisig is fine but it would have been nicer if the sisig was a bit crunchy or had more flavors. Complimentary traditional pandesal is also served. It is best eaten while it is super hot. This is often ignored though because it is a bit heavy and people want to reserve some stomach space for the main dishes. Shiitake Mushroom Cappuccino (P188 +10%sc). Adobo Shiitake Mushroom Puree topped with Creamy Garlic Foam and drizzled with White Truffle Oil. The concept is quite interesting. It tastes like light adobo soup with mushrooms, topped with creamy foam and served in a coffee cup — just like a cappuccino. It was surprisingly good (I honestly couldn’t imagine ordering adobo in soup form). We loved it! Chef Laudico personally served the dishes and explained to Lara what each dish was about. Lara took down notes and occasionally took some photos with her G11. Actually, she was a photographer when she was first discovered by an editor in Hong Kong. But these days, she concentrates on writing and lets an official photographer of the magazine take the official food shots. I also learned that night that Chef Roland has been cooking since he was 7 years old. He is a maverick innovator who pioneered the private dining scene in his house in Urdaneta (which has been sadly discontinued). He beefed up his culinary experience with his stints in Chambery (in France), Hugos, Lothars and Korean Bop. Four years ago, they decided to to put up a fine-dining Filipino restaurant in Bonifacio Global City (friends thought they were crazy). 3 Kinds of Mangoes and Kesong Puti (288 +10%sc). Mesclun Salad tossed in Dijon Bagoong Vinaigrette topped with Dried, Green and & Ripe Mangoes, Tomatoes & Kasuy Crusted Fresh White Cheese. This signature salad is quite playful with its ingredients — dried mangoes together with its green and ripe cousins, drizzled with a bagoong-infused salad dressing. The kesong puti with kasuy crust added the right subtle flavor and texture to this salad. It was presented well in a sun-inspired arrangement with the proper height and texture. Tuna in Burong Hipon (P388 +10%sc). Grilled Tuna Loin served with Pickled Garlic Shrimp Sauce on Paella Rice wrapped in Petchay. I like the way Chef Laudico showcases the unique Filipino flavors and ingredients in a very nice presentation without sacrificing taste. The tuna was grilled well and it had the right flavors and juiciness inside it. I personally liked the sour taste of buro, which is composed of fermented shrimps, particularly when it is mixed with the paella rice and little bits of tuna. Slow Roasted US Beef Short Plate in Kare Kare Sauce (P488 +10%sc). with Turmeric Rice, Creamed Banana Heart, Grilled Eggplant Chutney and Garlic Petchay Saute. This is Chef Laudico’s version of deconstructed Kare Kare where the vegetables, sauce and meat are arranged and presented separately. He uses the cow belly part, which is soft and still juicy from the slow cooking. What made this awesome for me was the bed of banana heart (also known as kulawo) in between the meat and the yellow rice. The combination actually worked for me. 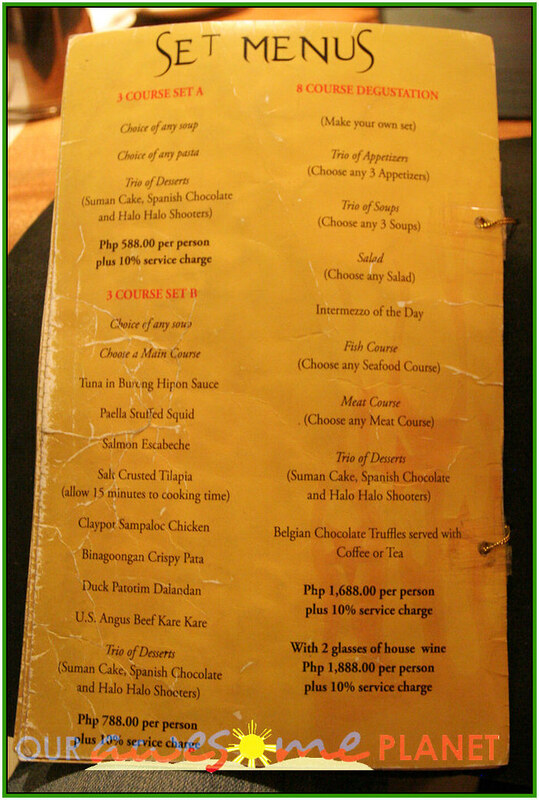 I liked the play of the creaminess of the banana heart with the Kare Kare sauce, together with the yummy pieces of beef. Do you have a signature foodie shot like Lara? 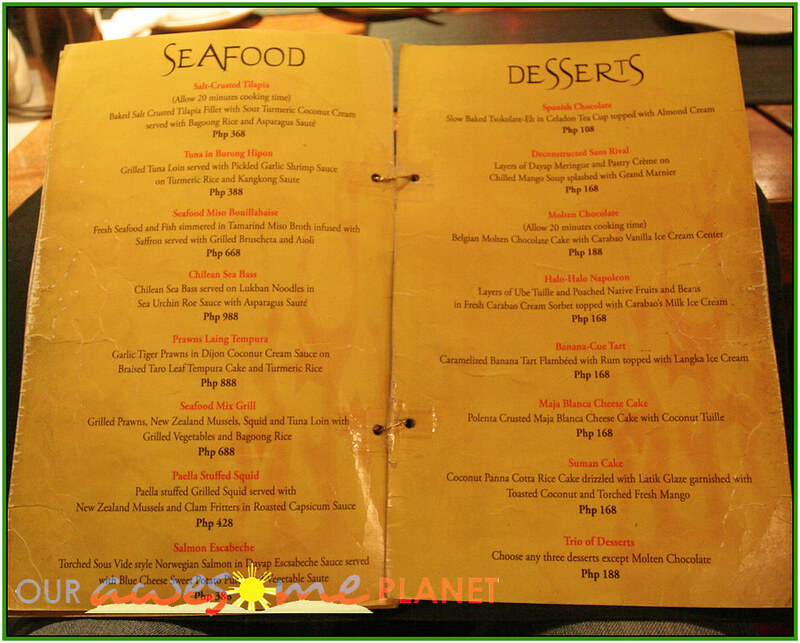 Trio of Desserts (P188 +10%sc). Suman Cake, Spanish Chocolate, and Halo Halo Shooter. The Halo Halo shooter was the best! Each one had tiny versions of rich-flavored ingredients served in just the right size that would satisfy one’s craving. I also liked the combination of coconut panna cotta with suman (rice cake), topped with mangoes. 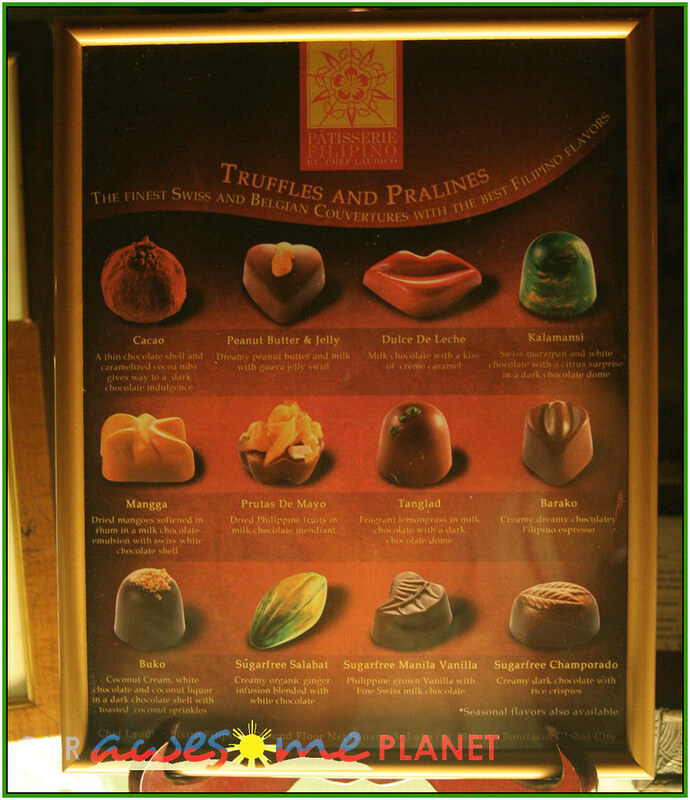 Finally, we ended the dinner experience with the Filipino-inspired chocolate truffles and pralines. My personal favorite is the heart-shaped strawberry chocolate with its bits and pieces of pop rocks that burst like mini firecrackers in your mouth. I also like the strong Barako chocolate and Salabat, which is sugar-free — good for diabetics. Tanglad. Fragrant lemongrass in milk chocolate with a dark chocolate dome. 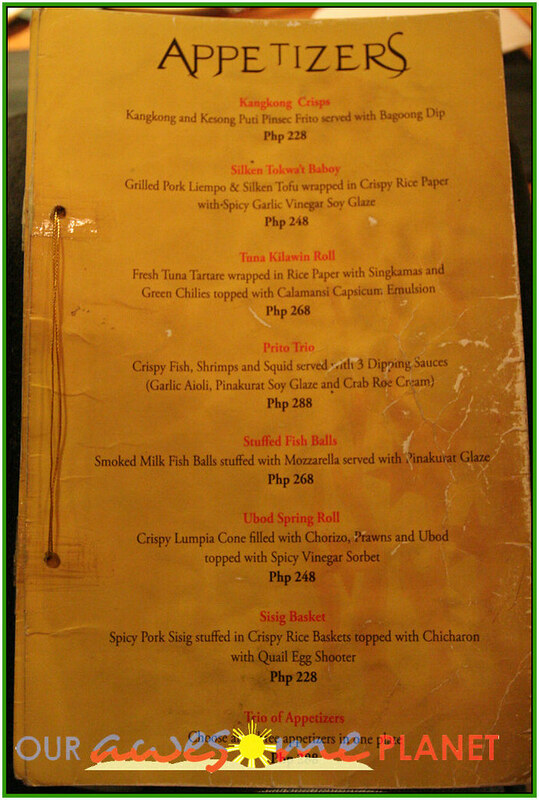 Chef Laudico’s Bistro Filipino will turn 4 years old on October 10, 2010. This anniversary will be special because they are launching the Bistro Filipino Cook Book containing all their secret recipes. Also, they will be launching the Filipino Breakfast restaurant in the Ayala Triangle Gardens. I’m looking forward to that! Disclosure: Since Lara is part of Travel + Leisure Magazine, she insisted on paying the bill because they are not allowed to get any freebies for articles that they write. This is the same policy I follow in Our Awesome Planet. We settled on a discounted rate for the entire dinner. Chef Adrian Cuenca’s Bone Marrow and Truffles Burger! 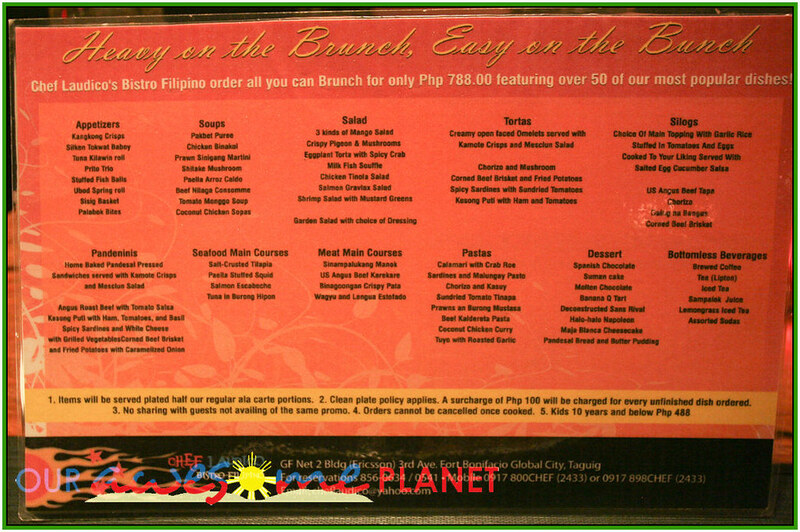 Arent they doing their brunch specials now, like ~PHP700 eat all you can but order by the menu, small servings but you get to try everything. I was surprised when I went there recently and it wasnt the usual ala carte. Got to eat so much…. I’m excited! A breakfast area in Ayala Triangle? I wonder how the setup would be. What would be the dishes like and would you know the price range? I’m also glad to hear that he is releasing a book with all his secret recipes. I heard he really kept it all a secret after what one of his chefs did before with his other recipes. looks good… but the portions, especially the soup and salad could be bigger. i like the concept of prettifying Filipino food for foreigners to better appreciate though. Just want to know if the Filipino breakfast restaurant you are talking about is already open? Many thanks. Keep up the good work!! !